Another year has whizzed by, I can hardly believe it. It seems like only a minute ago that we were moving into Balsam Hall. Where on earth does time go? It goes too fast wherever it goes. After the Royal there were a LOT of clinics and lessons to be done. Everyone wanting to enjoy the mild start to winter. Trailers are still out on the roads and people shipping in and out for lessons, unusual for November and December. Christmas was ‘busy’. Selena and I did the barns (25 horses), then did stockings and presents. After a quick tidy up so we could find the dogs under the wrapping paper, it was already time to go and do afternoon stables – as I said, time just whizzes by at this barn. Christmas Dinner and recovery took from four o’clock to ten o’clock, then late night check and back to bed. Now it’s already time to be organizing shipping papers, hay, travel arrangements for the nine or ten horses going to Ocala in the next two weeks. We have a fairly big contingent with only one free stall at the moment….anyone out there who would like their horse (with or without rider) to do a season in Ocala…it’s last call! Selena has room for one more horse. Selena and I would very much like to take this end of season opportunity to thank Selena’s sponsors. We literally could not do this without you. If you were not there for us, we would not be here at all and Selena would not be living her dream. THANK YOU, all of you, for what you do, what you did, and what you plan. Purina Agribrands – Wonderful feed that keeps our horses looking fantastic throughout every heavy competition season, year after year. Omega Alpha – Joint and general health supplements – definitely THE BEST there are, our horses are BODY COMFORTABLE thanks to you. FITS – We love our FITS breeches, they are the most comfortable breeches and tops that we have ever ridden in. Haygain – You keep our horses breathing and eating when the going gets tough. Charles Owen – Our hats are so comfortable we forget we have them on – what more can you say? Royal Stirrups – Safe, grippy, lightweight and solid built – love them. we move them from saddle to saddle if there are no extra pairs. Leather Therapy – This is the stuff that keeps our tack soft, supple and safe! JoJo Sox – great sox, never fall down inside boots! La Mundial Boots – love LM boots! Zetamin – our longest sponsor having helped Selena for fifteen years with their mineral/vitamin supplement. 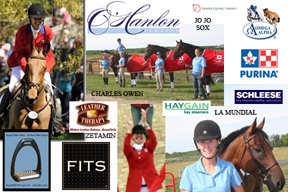 Thank you everybody for being part of the O’Hanlon Eventing Team. We are more than looking forward to 2012, it’s going to be an exciting year!